Pizza Pizza Royalty Corp. (“PPRC”), formerly Pizza Pizza Royalty Income Fund, is a corporation which owns the trademarks used by Pizza Pizza Limited (the “Company”) in its Pizza Pizza and Pizza 73 restaurants. The Pizza Pizza trademarks are licensed to the Company for which the Company pays PPRC a royalty equal to 6% of the system sales of Pizza Pizza restaurants in the Royalty Pool. The Pizza 73 trademarks are licensed to the Company, for which the Company pays PPRC a royalty equal to 9% of the system sales of the Pizza 73 restaurants in the Royalty Pool. As of January 1, 2019, 772 restaurants were in the Royalty Pool, consisting of 660 Pizza Pizza restaurants and 112 Pizza 73 restaurants. New restaurants are added to the Royalty Pool each January 1. A key attribute of PPRC is that revenues are based on top-line, system sales of the Royalty Pool restaurants and not the profitability of either the Company or the restaurants of the Royalty Pool. The success of PPRC depends primarily on the ability of the Company to maintain and increase system sales of the Royalty Pool and to meet its royalty obligations. PPRC´s sahres are listed on the Toronto Stock Exchange under the symbol PZA. The Company, a privately-held Canadian corporation, is one of Canada´s most successful operators in the quick service restaurant industry. Founded in 1967, Pizza Pizza restaurants serve over 30 million customers annually, providing an array of traditional and gourmet pizzas, a variety of chicken offerings, fries, sandwiches, salads and drinks. The Company is guided by a mission to provide the “best food, made especially for you” and a focus on quality ingredients, customer service, community contribution and continual innovation. The Company acquired Pizza 73 Inc. in July 2007. Founded in 1985, Pizza 73, with its recognizable phone numbers ending in “7373”, currently has 76 restaurants in its system. 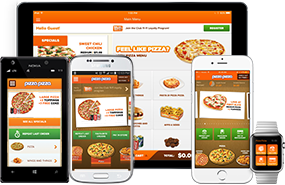 Pizza 73 operates in the take-out and delivery pizza QSR segment, principally in the province of Alberta. Pizza 73 currently has five locations outside of Alberta; three in Saskatchewan and two in British Columbia. Pizza 73 restaurants are not franchised, but instead are owned and operated as independent businesses. Each restaurant is a corporation equally owned by an independent owner/operator and the Company. The Company has an effective 23.0% interest in PPRC. Since royalty income of PRPC is based on top-line system sales, the success of PPRC depends primarily on the ability of the Company to maintain and increase system sales of the Royalty Pool. The following is a list of all persons known to the Company to provide analyst coverage of the Company or have published research reports regarding the Company in the past. Feedback to Company Chairperson: Shareholders may also provide feedback directly to the Chairperson of the Board of the Pizza Pizza Royalty Corp. at: fundchairperson@pizzapizza.ca.